Provan defines four wrong ways of reading Scripture. The ways are (1) historical criticism, (2) postmodern reading, (3) the Chicago constituency, and (4) counter-reformational Protestantism (13–19). The last view Provan calls the seriously literal interpretation of Scripture, and he advocates for this way (20). “My argument will establish that the Reformers’ confidence about our ability to read Scripture ‘rightly’ was well grounded, even if not everything that Protestant Bible interpreters have said about the Bible has itself been right, and even if there are dimensions to what a right reading of Scripture looks like that contemporary ‘reformed’ readers will inevitably add to the reading tradition that precedes them. We still have good grounds, in particular, for thinking that Scripture is clear enough in what it says to be capable of ‘teaching, rebuking, correcting, and training in righteousness’ (2 Tim 3:16). The ‘seriously literal interpretation’ of Scripture is still well capable of discerning the word that God wishes to address to both the Church and the word” (24). Generally speaking, Provan views these two ways as useful when critically engaged. In other words, rhetorical criticism may usefully assist in biblical interpretation. So while not entirely accepting nor dismissive, Provan critically engages these methods and sees some benefit in using them for biblical interpretation. Most readers will find Provan’s critiques here relevant since a significant amount of evangelical interpretation uses these two ways of reading Scripture. By Chicago constituency, Provan has in mind Norman Geisler’s understanding of the Chicago Statement of Biblical Hermeneutics (not to be confused with the earlier statement on inerrancy). In the first instance, Provan questions the legitimacy of the argument that an error in Scripture entails that God is a liar (427). Here he responds in particular to the argument of John Feinberg and others who follow his logic. Provan sees Scripture as partly the product of humans with limitations in knowledge (428). Since article 6 of CSBH affirms that Scripture comes by way of propositions that do not make factual errors (along with Feinberg and others who affirm similar things), Provan concludes that “There is no genuine space here for biblical texts marked by time- and culture-bound limitations” (428). Practically speaking, the logic CSBH (at least of those who interpret it along with Geisler) leads to taking a text like Proverbs 10:4 (“a slack hand causes poverty, but the hand of the diligent makes rich”) as a proposition that reveals facts, despite the reality that this is often not true (428). 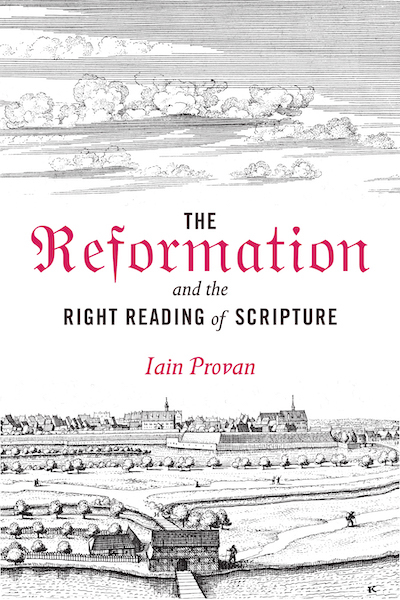 To protect against such a misreading, Provan advocates a return to the reformers who “understood Scripture as truly human literature that is inspired by God” (428). Provan also criticizes CSBH’s engagement with science (429–432) and inconsistent use of double-think, namely, using external sources sometimes but at other times not allowing for it (432–435). Provan’s critique mainly falls into a wing of CSBH, one that has become increasingly unpopular but probably common in many churches. And many who still appreciate CSBH can and will agree with much of what Provan has to say. One problem with CSBH—that Provan only lightly touches upon in a footnote—is the diversity in meaning attributed to the CSBH by its authors. For example, R.C. Sproul would understand the meaning of CSBH much differently than Norman Geisler! Today, most evangelicals understand the genre or Proverbs to allow for aphorisms that are not always true—but teach general truths. Others consistently maintain that science can be a helpful tool to understand Scripture just as philology, an historical science, is when it comes to understanding the meaning of words in the text. I did not find Provan’s critique overly harsh then. I rather saw him as highlighting one sliver of the evangelical movement’s interpretation of Scripture and providing some pushback. Fair enough, and the forthright and direct argument adds to the clarity of Provan’s thesis. As to his criticism of counter-reformational Protestantism, he mainly targets his colleague Hans Boersma as well as others in the retrieval movement (416). Provan disagrees with Boersma’s sacramental view of the world (416–417, 418). He completely dismisses any benefit from Christian Platonism, writing, “Plato does not help; he hinders” (417). For Provan, Boersma’s Plato-Christian synthesis (and the presumed synthesis that goes back to the early church) absolutely fails to work today and is a “retrograde approach (423). Modernism brought a better world than anything before the Reformation had brought, Provan claims (425). And so Christian Platonism has had its hey-day and has rightly died the death it deserves. I think Provan takes too much umbrage with his colleague Boersma. For that reason, he sees little value in the Christian-platonist synthesis. Of course, that synthesis and Boersma himself are not closed off to criticism! Far from it. But Christians did not actually embrace Platonism nor synthesized it improperly (some individuals likely did so but the whole tradition). Early Christians simply used the language and metaphors of their day to express biblical truth—which any reader of the fathers would see. And while Boersma may go beyond what is helpful, we should not throw out the important terms and ideas that Christians have developed to talk about God over the centuries. In this case, Provan goes overboard in his rejection of Christian Platonism because he focuses on one proponent (Boersma). Craig Carter’s recent work on Interpreting Scripture with the Great Tradition provides a better balance to the relative worth of Christian Platonism. Provan has written a sweeping, well-written, well-researched book on seemingly every topic that has to do with biblical interpretation—at least when it comes to the recent history of biblical interpretation. He points readers back to the Reformers whom he sees as reading the Bible as a canonical work, written by human authors, and inspired by God. In this sense, he seems to follow and go slightly beyond Brevard Childs. This massive 712-page volume will challenge readers to return to the Reformation’s emphasis on the literal sense of Scripture. It will inform readers as well. Yet I am not sure that Provan has rightly understood the Christian-Platonist synthesis of the early church. For that reason, he misses the essential insight that John Calvin, as Craig Carter argues, defines the Christological sense as the spiritual sense of Scripture as the culmination of earlier Christian interpretation. Hence, Christian Platonism, rightly understood, merely uses the idioms and language of the first to fourth centuries to explain what the Bible means. It means, we find, that Christ lies at the centre of Christian scripture. So read Provan’s work but realize that he has not rightly understood the entirety of the history that he uses to argue his case. Still, I confess, I enjoyed his work and will likely refer to it again in the future. Disclaimer: The publisher provided me with a review copy of the book, although I was under no obligation to give it a positive review. – The seriously literal interpretation of Scripture, I believe is the logical mindset. “I am the way the truth and the life”, I can interpret only one way. So, establishing the core truth, such as John 16:7-15… 2 Timothy 3:16, and diligently pray-fast-study — witness Christ, steadfast positionally in the Light. So, I believe in a literary core and a spiritual core, both vital to achieving a competent comprehension. We will no doubt always be imperfect, but that’s ok if we walk in the light so as always to be correctable.